Tomorrow The Force Awakens arrives on Blu-Ray — the first new live-action Star Wars home release in 11 years. There are a handful of exclusive versions and many tie-in sales. Prep for your Tuesday shopping by joining Arnie and Marjorie to find out which version is right for you! Plus tomorrow also marks the rerelease of the Disney Store exclusive Elite figures — including a new Boba Fett! Find out how you can score these figures that have commanded top dollar on eBay. With a report from Wizard World Chicago, a review of the latest Funko Smuggler’s Bounty box, and more, it’s all in this new episode of Star Wars Action News! Ten years ago, August 30, 2005, two Star Wars collectors released the world’s first podcast dedicated to Star Wars collecting: Star Wars Action News. From the Revenge of the Sith line through The Black Series, and even looking back at Vintage and 90s toys, Marjorie and Arnie have covered it all. 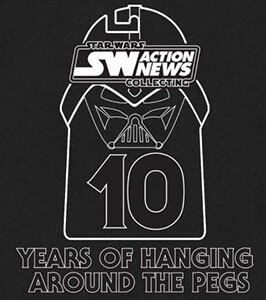 Now join Star Wars Action News at a party to celebrate this milestone! At Wizard World, Chicago, join Arnie, Marjorie, Brock, Jerry, Daryl, Andrew, and other members of the Star Wars Action News team for drinks, food, cake, and fun! The party starts at 7:30pm, Saturday, Aug 22 at the Hyatt Regency O’Hare, the hotel attached by skywalk to the Stephens Convention Center. Brock reviews the new Star Wars novel A New Dawn, Marjorie and Arnie review Black Series Wave 4, plus reports from Wizard World Chicago and Gen Con! Last Spring it was announced that the Star Wars canon was taking a new direction. To pave way for the upcoming Episode VII as well as the Rebels TV series the previous Star Wars “Expanded Universe” was reclassified as Star Wars Legends, wiping the slate clean for a new era of Star Wars stories. That begins today with the release of A New Dawn, the Star Wars Rebels tie-in novel by John Jackson Miller. In this episode of Star Wars Action News, Brock joins us with a review of this first novel in a new age of Star Wars fiction. ​Also on this week’s show, Marjorie and Arnie review Hasbro’s 4th wave of Black Series 3.75-inch figures. From Dagobah Luke to Yoda to Toryn Farr, watch the video to see hands-on reviews of these collector-oriented figures! With reports from Wizard World Chicago and GenCon, eating fresh with Rebels, and much more, it’s all in this episode of Star Wars Action News! Episode 422: To Buy, Or Not To Buy? That is the Question. Yes, Sideshow Collectibles has put up for pre-order its newest life-sized Star Wars figure — The Han Solo in Carbonite. And it has Arnie waxing philosophical about collecting, and how much is too much to spend on one item. On this episode of the Star Wars Action News podcast he and Marjorie review all the information released about this new high-end item. Join them for this discussion! Also on this week’s show, Hasbro’s new 6-inch Star Wars line has reinvigorated action figure collectors, but with a new scale come old problems–like figure balance. NECA makes a line of figure stands for 6 to 8-inch figures, but do they work for the Black Series? Watch to see how this round peg fits in that foot hole! Also in this episode are reviews of the Hasbro’s Mission Series figures Wave 2, including Han Solo, Chewbacca, Obi-Wan Kenobi, Darth Maul, R2-D2, and C-3PO! With a Savage new Premium Format figure, a report from Wizard World St. Louis, an interview with Star Wars sketch card artist Chris Hamer, and so much more, it’s all in this episode of Star Wars Action News! This weekend was Wizard World Chicago 2013, and the Star Wars Action News crew were there, as were tons of Star Wars toys. From rare vintage Star Wars items from Hasbro and Palitoy to new Black Series figures in both scales! With a new show layout and big guests, listen to find out if you should attend the next Wizard World in your area! But the biggest news of the week is Hasbro’s new Black Series figures! The new wave of 3.75-inch figures are hitting stores coast to coast. The hosts provide a carded review of these new figures and detail some problems that carded collectors may need to watch out for! With Star Wars burlesque at Chicago’s Gorilla Tango Theater, disappointment at D23, and more, it’s all in this week’s Star Wars Action News! Episode 386: St. Louis is Wizard! Wizard World conventions are a staple for sci-fi and comic book fans. Having produced their multi-city conventions for years in Philadelphia, Chicago, and many other cities, they now expand their reach deeper in the midwest this year with Wizard World St. Louis! Marjorie and Arnie were at the con meeting Star Wars fans, celebrities, and seeing what Star Wars collectibles were for sale! With the 2014 St. Louis convention already announced, should you save the date? Listen to Arnie & Marjorie’s report to find out! Also this week, Johnathan is back with a look at the 2013 Movie Heroes action figures, Jerry gives a Vintage Viewpoint from Endor, and Steve the Gingerprince reports in from the UK–with a chance for one lucky listener to win some of the 2013 Yoda carded Clone Wars figures not released in the USA! Our friends at YodasNews.com and Sandtroopers.com are attending Wizard World Comic Con in Chicago this weekend. Head on over to check out their coverage of the event and be sure to listen to the next Star Wars Action News podcast as Arnie and Marjorie made the trip to the Windy City as well. Marjorie & Arnie are back from Chicago Wizard World and are here this week to review a handful of new purchases, all of which happen to be Gentle Giant mini-busts: The Entertainment Earth exclusive Revenge of the Sith Obi-Wan Kenobi, the San Diego Comic-Con exclusive McQuarrie Concept Snowtrooper, the Expanded Universe based Twi’lek Darth Talon, and another Twi’lek–Oola from Jabba’s palace. They discuss the details of these busts, and address the recent price increases among these and other high-end collectibles. Also this week, Steve reports in from post-riot UK with what toys he’s finding on shelves, and Marjorie and Arnie run down the latest online finds, including some very cool new items from Kotobukiya that are not yet available in the states. With TWO contests, one where you can win a custom Han in Carbonite Mighty Mugg and one from Backstage Toys where you can win the Toys R Us exclusive Battle of Geonosis figure set, it’s all on this week’s Star Wars Action News podcast!